When the Kia Pro_Cee'd GT was revealed the Korean brand forgot to show how the car looked from behind, indicating there could be something very wrong with it. 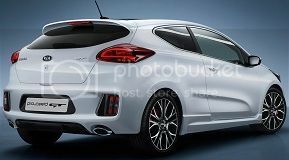 To calm these rumors a few new images appeared online revealing that specific part of the sporty three-door hatchback. Official: Kia Pro_Cee'd GT and Cee'd GT - New images! Two days ago you saw here the first two images of the upcoming Pro_Cee'd GT and today Kia decided to reveal a little more about "the brand’s most performance-focused production car ever", including more images, a few technical details and the confirmation of the 3 and 5 door versions. That is right, what you have here are the first two images of the upcoming Kia Pro_Cee'd GT revealed well ahead of the Geneva Motor Show in a Russian website, and the car looks great with an aggressive front that i am sure will be a hard rival to the Golf GTI. This time we get to see the front and the back of the car in some sort of hand-drawn image, but we also get some fresh informations about technical details of this new version.